Dawn Wilson Wellbeing was founded by Dawn Wilson (MABCH/MCAHYP), a fully qualified Hypnotherapist of twenty years standing, with an established health practice in Brighton and London, UK. Furthermore, Dawn is a twenty-five year experienced healthy food chef. 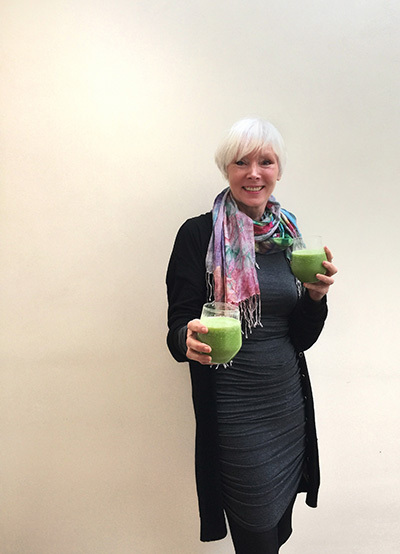 During this time, she trained as a raw food and juice specialist…and, as such, has been a successful practitioner long before it “caught on” as an acknowledged approach to healthy nutrition. Dawn’s expertise and experience have now been applied to bring the most appropriate holistic practices to her clients. Dawn has studied intensively a range of Holistic Practices and Cognitive Therapies, as well as Hypnosis and Psychic Learning. She has travelled to Bali, Israel, India and the US, gaining several trainings from respected centres of learning. For example, when studying in India she immersed herself in AYURVEDIC and Yoga practices. In the USA, Dawn completed the Life Transformation Programme at the world famous Hippocrates Institute in Florida. The Institute demonstrates effective methods to restore health and vitality through plant-based living and cellular rejuvenation. The Hippocrates Institute is a highly regarded global Centre of Excellence for the cure of cancer. Here, Dawn successfully deployed naturopathic remedies, raw food juice cleansing and detox to heal her own body of cancer. She has integrated these practices into her work and treatments. Dawn also undertakes one-to-one assignments, by special arrangement, in London to develop emotional, physical and dietary solutions. Dawn’s expertise has been applied on many highly coveted engagements, including working with Pierce Brosnan, as his personal chef in the run up to his role as 007 in ‘The World is Not Enough’… a job where only the highest levels of expertise would be accepted, getting the superstar and acclaimed actor in top condition for one of the world’s biggest box office phenomena! A quite different, more recent example, was when the Sussex UK fire service engaged her to develop and advise on a programme for high energy healthy eating; it was so successful that it was then was rolled out into six of their major stations. Development and running one-day Feel Good Wellbeing Days is now a very popular part of Dawn’s holistic practice therapies. Dawn also runs meditation classes in mind mastery. In 2016, Dawn was delighted to accept the prestigious invitation to become a Member of the Royal Society of Medicine. She believes this is in part an acknowledgement of the successes during her career and is proud to be one of their Senior Associates.